During a workout, your body primarily loses water through sweat. A small amount is also exhaled as water vapor in your breath. If you don’t replace the fluids that are lost during a workout, dehydration can occur. Indeed, exercise performance can be significantly impaired when 2 percent of body weight or more is lost through sweat (1, 2). While athletic performance declines quickly with dehydration, it is unlikely that you would need to consume one gallon, or 16 cups of water, during your workout. In fact, this is the amount of water that the Institute of Medicine recommends healthy men consume over the entire day. For women, the guidelines recommend about three-fourths of a gallon, or a little over 11 cups of water, per day (3). Preventing dehydration is one of the most effective ways to maintain exercise capacity (1). During exercise, water serves to transport nutrients, remove waste products, provide cushioning, and prevent overheating (4). There’s no doubt that proper hydration is essential for performance, but there is no benefit to drinking water in excess. 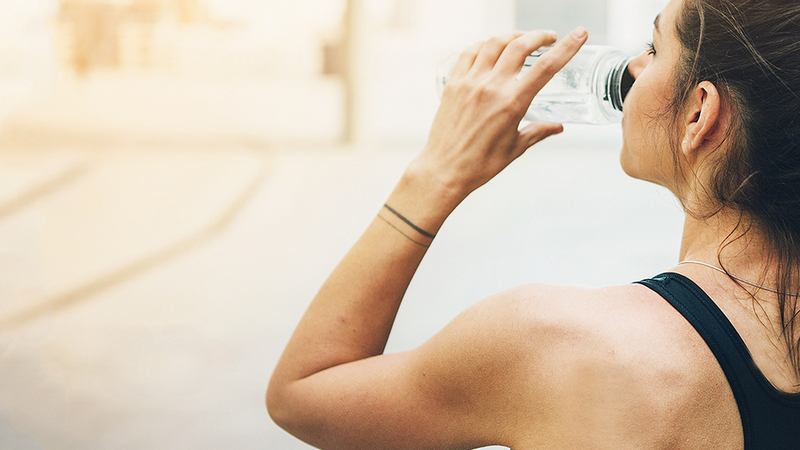 What Happens When You Overhydrate? While severe overhydration is rare, recreational athletes are at a higher risk compared to other groups (5). When you sweat, your body loses both water and sodium along with trace amounts of potassium and other electrolyte minerals. Drinking plain water helps to replace fluids but does not replenish these electrolytes. Overhydration can further deplete your body of electrolytes and increase the risk of developing an electrolyte imbalance following exercise (5). Drinking too much plain water while sweating heavily can cause blood sodium levels to plummet, a condition known as “hyponatremia.” Symptoms of mild hyponatremia can include bloating, puffiness, and muscle cramps during and after a workout, but symptoms can become serious in extreme cases (5). While you could precisely calculate the right amount of water to drink during exercise, almost all athletes will be able to meet their needs by simply paying attention to thirst (6). Hydrating before, during, and after a workout and drinking when you feel thirsty are sensible strategies that are effective for most types of training. However, intense workouts require more than plain water since replacing electrolytes is essential for optimal hydration. Sports drinks are a great way to stay hydrated and restore electrolyte balance after heavy sweating. Unfortunately, many popular sports drinks are sugary and high in calories, while other varieties rely on artificial flavors and sweeteners for taste. 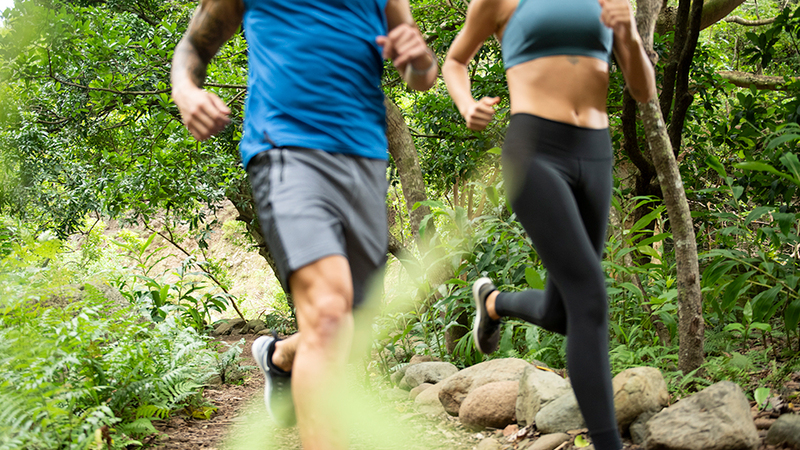 AMPED™ Hydrate is an alternative to ordinary sports drinks that helps replenish electrolytes lost through sweat without the excess sugar and calories. While overhydration and hyponatremia are rare, there is no benefit to drinking more water than you need. This is because the body has no way to store extra water for later use and must eliminate the excess to maintain fluid balance. 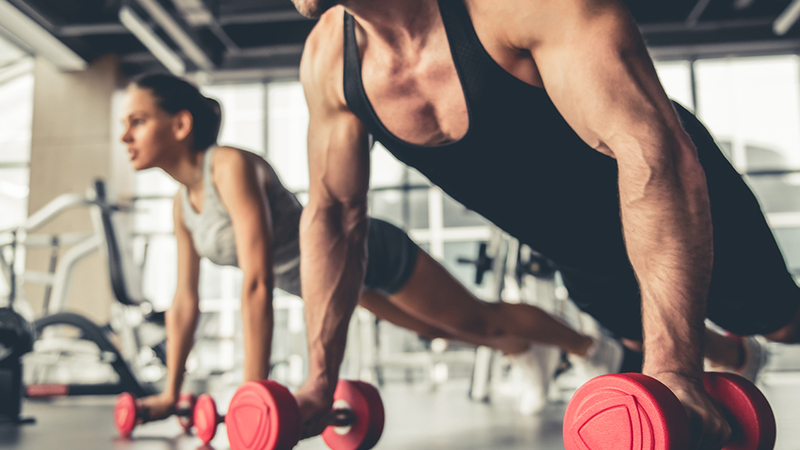 Forcing down large amounts of water during exercise is an ineffective strategy that may have you spending more time in the bathroom than working out. So, the next time you head to the gym, leave the gallon jug of water at home. Drinking water before, during, and after your exercise session and replacing electrolytes with a quality sports drink like AMPED Hydrate will give you the hydration you need. Kerksick CM, Wilborn CD, Roberts MD et al. ISSN exercise & sports nutrition review update: research & recommendations. J Int Soc Sports Nutr. 2018; 15: 38. American College of Sports Medicine, Sawka MN, Burke LM, Eichner ER, Maughan RJ, Montain SJ, Stachenfeld NS (a). American College of Sports Medicine position stand. Exercise and fluid replacement. Med Sci Sports Exerc. 2007 Feb;39(2):377-90. Institute of Medicine. Dietary Reference Intakes for Water, Potassium, Sodium, Chloride, and Sulfate. Institute of Medicine Panel on Dietary Reference Intakes for Electrolytes and Water, Standing Committee on the Scientific Evaluation of Dietary Reference Intakes. Washington, D.C. National Academies Press 2005. MacLaren D, Morton J. Biochemistry for Sport and Exercise Metabolism. Hoboken, NJ: Wiley-Blackwell; 2012. Hew-Butler T, Rosner MH, Fowkes-Godek S et al. Statement of the Third International Exercise-Associated Hyponatremia Consensus Development Conference, Carlsbad, California, 2015. Clin J Sport Med. 2015 Jul;25(4):303-20. Thomas DT, Erdman KA, Burke LM. Position of the Academy of Nutrition and Dietetics, Dietitians of Canada, and the American College of Sports Medicine: Nutrition and Athletic Performance. J Acad Nutr Diet. 2016 Mar;116(3):501-528. doi: 10.1016/j.jand.2015.12.006.